Out of 179 ratings, Mexico claims spot 149, this according to the Reporters Without Borders Press Freedom Index 2011/2012, falling 13 places from the last Index. The downgrade can be attributed largely to the “federal government’s offensive against drug trafficking”, according to Reporters Without Borders. The government has not been taking a very strong stand against drug cartels to protect its journalists; journalists have to fear for their lives if they want to give the people the whole, uncensored truth. As detailed by The World Factbook, Mexico is located in North America, between the United States and Belize. Of its 114,975,406 citizens, 28.2% are 0-14 years old, 65.2% are 15-64 years old, and 6.6% are 65 years old and over. Population growth rate is 1.086%, putting Mexico at 109 of 230. The birth rate is 18.87 births/ 1,000 population, placing it at 102, while the death rate is 4.9 deaths/ 1,000 population, placing it at 188. In Mexico, there is an intermediate degree of risk for major infectious diseases, which include food or waterborne diseases such as bacterial diarrhea, hepatitis A, and typhoid fever; vectorborne diseases such as dengue fever; and water contact diseases like leptospirosis. 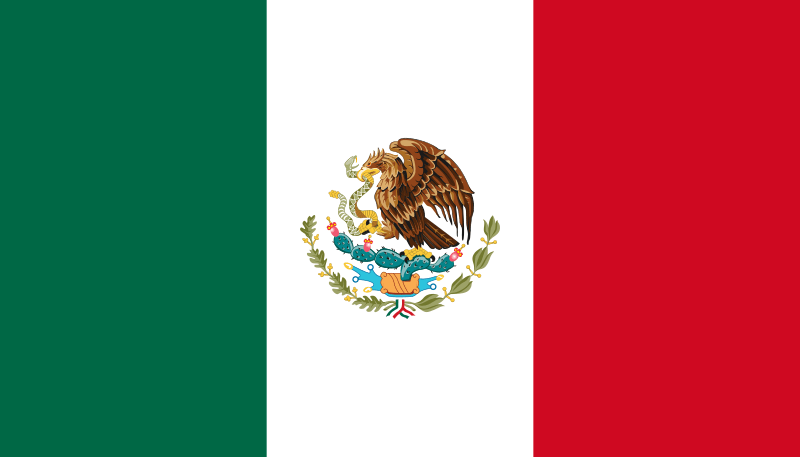 Mexico is known for petroleum, silver, and copper as far as natural resources, and its food, ancient civilizations (namely Aztecs and Mayans), and traditional Mexican clothing as far as its people. Mexico has a shared history with the United States in some aspects; between 1846 and 1848 the Mexican-American War took place, resulting in Mexico losing nearly half of its original land to the United States, including Texas. It wasn’t until almost 100 years later that Mexico, in 1942, joined the United States, among others, in declaring war against the Axis in World War II. Mexico is a federal republic, and its legal system has U.S. constitutional law theory influence; this influence includes judicial review of legislative facts. As such, its citizens indulge in many of the same freedoms as citizens of the United States, at least on paper. However, there are limitations Mexican citizens experience that citizens of the United States do not. In the Mexican Constitution of 1917, freedom of press is protected to much of the same extent as it is the U.S. Constitution. On a large scale, Mexico is on par with the United States with overall freedoms. In 1857, the Mexican Constitution gave Mexican citizens freedom of speech, and in Article 6 of the Mexican Constitution of 1917, it states that the exchange of ideas is to be left undisturbed with the exception of those ideas that are an attack on morality, an attack on a third party, provoke crimes, or disturb public order. The first rule listed, morality, is the one that is up to the discretion of the government. In the past, morality has had its influence on flag desecration, whether it be through flag burning or poetry; both of these are seen as unlawful. As far as speech in the modern day, there is no clearer example of speech as in Twitter. According to a CNN World article, two people in Veracruz were accused of terrorism and sabotage after they falsely tweeted about school attacks. These tweets led to real-life drama as parents rushed to get their children out of presumed danger, leading to charges of up to 30 years behind bars for the suspects. While the tweets can be seen as a threat to public safety, it has been argued by free speech proponents that the punishment does not fit the crime. The violation of free speech, though, is not exclusive to Twitter in cyberspace. According to an article by The Economist, two young people were found dead in Nuevo Laredo with a note reading: “This will happen to all the gossips on the internet.” This incident can be attributed to drug cartels, which are not only chilling speech among Mexico’s citizens, but also among media as a whole. As far as the history of free press, it follows the same basic pattern as free speech. People have the ability to express themselves through television, radio, newspapers, and the Internet. But progress has not only come to a halt, it is going in reverse. Freedoms seem to have been reduced, not by the hand of government, but by the hand of drug cartels. The most prominent issue with free press right now is the chilling effect the drug wars are having on the media. According to IFEX, there have been “172 attacks on press freedom, including nine journalists and two media workers killed.” Reporting on the drug wars is almost sure death for journalists, resulting in self-censorship; many media outlets are no longer reporting on drug cartels because of fear, and one newspaper, El Diario de Juarez, went as far as to publish a story entitled “¿Qué quieren de nosotros?” (What do you want from us? ), referring to the drug cartels. The media seems to be at the mercy of drug cartels, making sure they don’t publish anything that will offend the wrong people, publishing only safe stories and erring on the side of caution. It wasn’t until last month, March 2012, that the Mexican Senate tried to protect journalists, making an attack on a journalist a federal crime under certain circumstances. It is not official yet, however; according to ARTICLE 19, 17 out of 31 states still have to approve it, which is projected to take about two and a half months. Still, it is a legislative step to try to protect journalists. With its implementation investigations can take place that will find the culprits in the 66 journalists killed since 2000. To summarize, Mexico has freedoms of speech and press, though both are being crippled by the drug war that doesn’t seem to have an end. So comparing Mexico to the United States, the United States is definitely freer, ranking at 47, more than 100 places above Mexico, on the Press Freedom Index. One example of limited speech is flag burning. As detailed in Texas v. Johnson, flag burning is permissible as symbolic speech, however much most people disagree with the action. In Mexico, however, desecrating the flag in any way is unlawful, even though penalties are usually minor, e.g., small fines, public warnings, etc. As far as social media, there have been cases where United State citizens have undergone investigation for things they posted on social media, but nobody has been arrested for a tweet, especially not for a possible 30 years. Freedom of press is another place Mexico and the United States differ. Media outlets are seen as the watchdog in the United States, watching what is going on and informing the general public. Time and time again the Supreme Court rules against cases that would promote self-censorship and the chilling effect. As stated before, Mexico only just recently passed the law that criminalizes attacks on journalists. Self-censorship is prevalent among Mexican media, because now it is not money or jail time they face, now it is their lives at stake, and the lives of their loved ones. There are certain risks that journalists willingly face in the name of free flow of information, but asking them to walk into the hands of the drug cartels is not something that can be done. Overall, it is obvious Mexico’s free speech and free press is suffering. Not only are they being threatened by drug cartels, but, until recently, the government was doing very little to protect them. They have the rights in theory, but when they try to put those rights into action lives are put in danger. The United States, on the other hand, has a long history of protecting speech. When you have the First Amendment on your side, it is almost a sure thing. In a way, Mexico and the United States seem to be going in different directions; Mexico is plummeting, giving up rights just to stay alive, while the United States is climbing in its pursuit of freedom of speech.